The thought of joining Doris Day and Frank Sinatra wasn’t a new idea. They had worked together on radio’s Your Hit Parade in the late 1940s, during Miss Day’s success as a band singer. 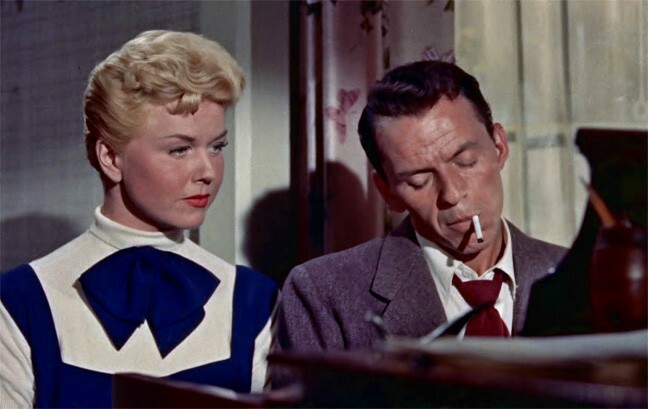 In 1954, Sinatra was teamed with Doris Day for the remake of an old James Garfield, Priscilla Lane film, Four Daughters which had been very popular when it was released in 1938. This time around it was renamed Young at Heart, and there were only three daughters, Doris Day, Dorothy Malone and Elisabeth Fraser. Even though Sinatra had won the Academy Award the year before in From Here to Eternity and had a hit record with Young at Heart, it was Doris Day who received top billing over him. The picture was released during the 1954 Christmas season and was very popular. Miss Day enjoyed a chart hit, Ready, Willing and Able and the film became the favorite of millions and regularly shown during the Christmas holidays. Robert Keith with daughters, Doris Day, Dorothy Malone and Elisabeth Fraser, with Ethel Barrymore as his sister. The story is about the lives of a musical family who live in a small Connecticut town. Widower, Gregory Tuttle (Robert Keith) lives with his three daughters and his sister, Aunt Jessie, played by the legendary Ethel Barrymore. It seems to be a perfect way of life where people get married, have children, go to church and care for their grandparents when they get old. Gig Young plays Alex Burke, a Broadway songwriter whose father went to college with Tuttle (Keith). 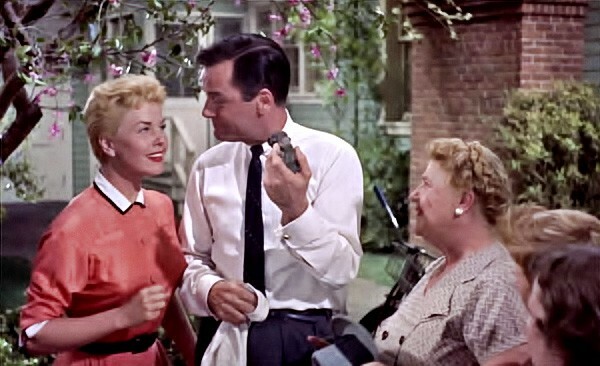 Into the lives of this family comes a handsome bachelor, Alex Burke (Gig Young), a Broadway songwriter whose father attended college with Tuttle. He’s in town to deliver a letter to the Foundation for which Tuttle is Dean of Faculty and is invited to reside at the Tuttle house to work on his music. Burke is brash and opinionated but fascinating to the three sisters, all of whom develop a crush on him on sight. Frank Sinatra (Barney Sloan) meets Ethel Barrymore (Aunt Jessie). Burke summons a troubled, but brilliant pianist he knows from New York to assist him with musical arrangements for his score when he hits a creative brick wall. Barney Sloan (Sinatra), a down-and-out singer, piano player, arrives at the Tuttle home, arrogant, with a chip on his shoulder. First, he meets Aunt Jessie, who scrutinizes him, making him aware that he is not the unfeeling character he pretends and that she is wise to his masquerade. The first scene between Frank and Doris is memorable. He is sitting at the piano in her living room, arranging Burke’s score when she enters, fascinated by his artistry. He glances up at her briefly and continues playing. When they finally talk, she discovers he’s cynical and self-doubting and feels the world is against him. The chemistry is unusual between the two stars; they are such opposites here – she’s upbeat and friendly and he’s withdrawn and aloof. Doris Day first meets Frank Sinatra playing the piano in her front room. Laurie falls in love with Alex, as do her two sisters. Dorothy Malone (Fran) is engaged to be married to Robert (Alan Hale, Jr.) and Amy (Fraser) has fallen for a likable plumber (Lonny Chapman), but both are smitten with their sister’s beau, Alex, who pops the question to Laurie during her father’s birthday bash. This announcement, of course, comes as a blow to the sisters and to Barney, who has secretly fallen in love with the gorgeous Laurie. What struck me, looking at this film again, was how old the sisters looked and to wonder why they were still living at home with their father and their aunt who ordered them up to bed! Barney plays in a local nightclub to supplement his income. Meanwhile, Alex has arranged for Barney to play at a local nightclub to supplement his income while in town. This gives Sinatra the opportunity to sing some wonderful old standards like One For My Baby by Harold Arlen and Johnny Mercer, Just One of Those Things (Cole Porter) and Someone to Watch Over Me by George and Ira Gershwin. The newer songs were reserved for Miss Day, who performed them flawlessly. Day and Sinatra were wonderful in their scenes together. As usual, Gig Young was a delight to watch. Most viewers will wonder how Doris could leave him for Sinatra, so what if her sisters had the shakes for him? He was charming. The singing was wonderful. Doris Day, of course, one of the finest chanteuses in the world had no problem with these lovely songs. She sounded perfectly angelic while singing Till My Love Comes to Me by Paul Francis Webster, Hold Me in Your Arms by Ray Heindorf, Charles Henderson and Don Pippin, There’s A Rising Moon for Every Fallen Star by Paul Francis Webster and Sammy Fain, and with Sinatra, You, My Love, by Mack Gordon and James Van Heusen. Piano solos for Sinatra were played by Andre Previn. This film is a far cry from what is produced today. Everybody in the picture looked perfect. The actors went to bed in full make-up. Even the snow was perfect. But, even with those flaws, this is very enjoyable family entertainment. 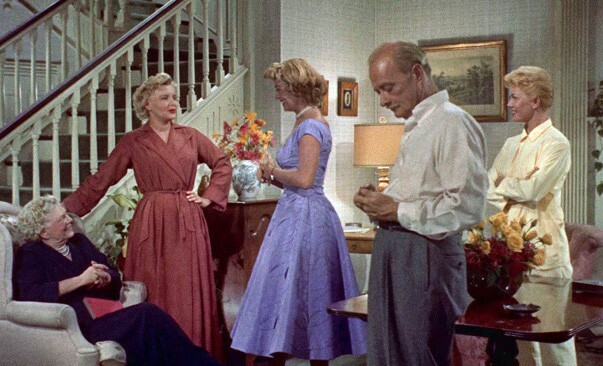 It helped solidify Miss Day’s standing in Hollywood as reliably good family fare, and set the tone for her next picture, MGM’s dramatic, Love Me or Leave Me. The direction by Gordon Douglas was perfect for the material and the cinematography by Ted McCord was just right. 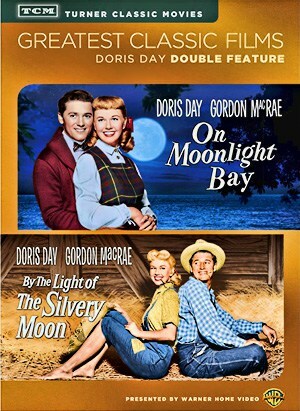 Doris Day enjoyed working again with Frank Sinatra during this film. They had previously worked together in the Your Hit Parade radio show, a weekly pop hits musical revue. Doris had not liked working in that type of radio format. When they were reunited for this film they had an amicable experience. 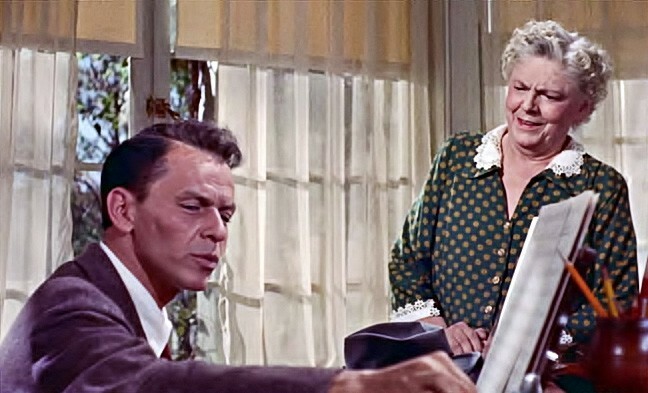 “Doris Day and Frank Sinatra, names to be reckoned with in several industries as well as motion pictures, team up here in a sentimental drama-with-music-tears-and-laughter that would seem to be box office gold in all situations. 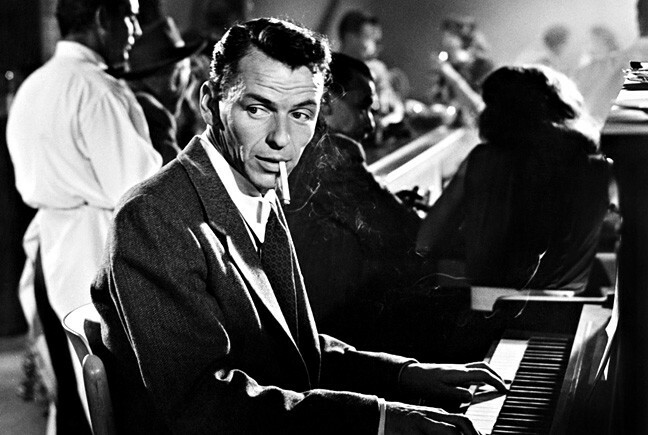 Starting with its title, the name of a song identified with Sinatra’s decisive and deserved comeback, the film has as many built-in exploitation features as the law of diminishing returns allows. Included among these features is, naturally, the carefully calculated freshness and charm of Miss Day, whether she’s belting out a solid number called Ready, Willing and Able, or brushing away an ill-concealed tear of heartbreak. 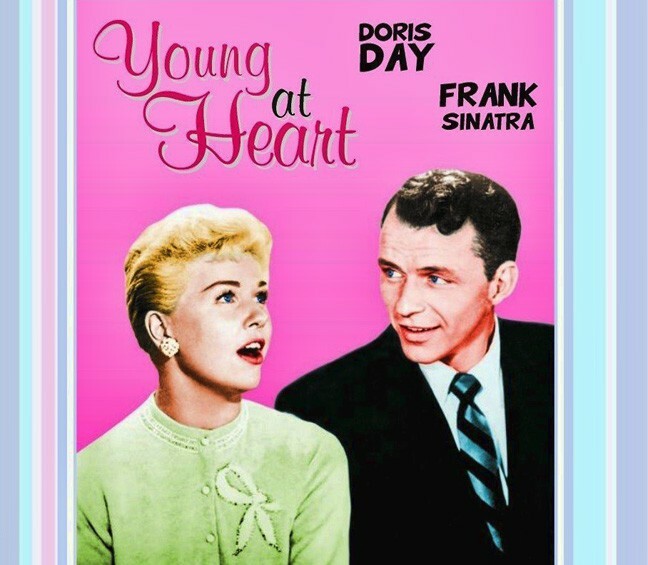 “Songs from the soundtrack were released as an album by Frank Sinatra and Doris Day, also titled Young at Heart. The album peaked at #11 on Billboard while the single reached #2 and was considered as Sinatra’s comeback single after several years away from the top of the pop singles chart. So popular was the song Young at Heart that the film was also titled Young at Heart, having had no title until the song’s success. The song’s popularity led to it being used not only for the title but also for music over the opening and closing credits. 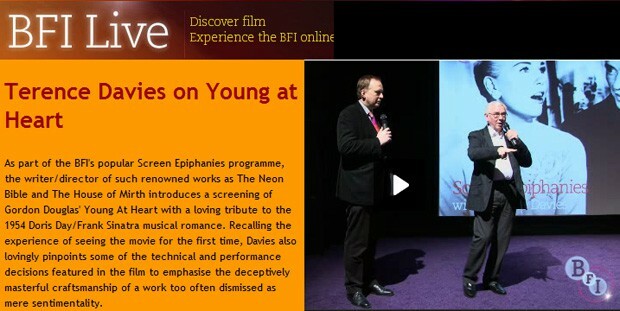 Film director Terence Davies, pays tribute to Young At Heart at the BFI London. 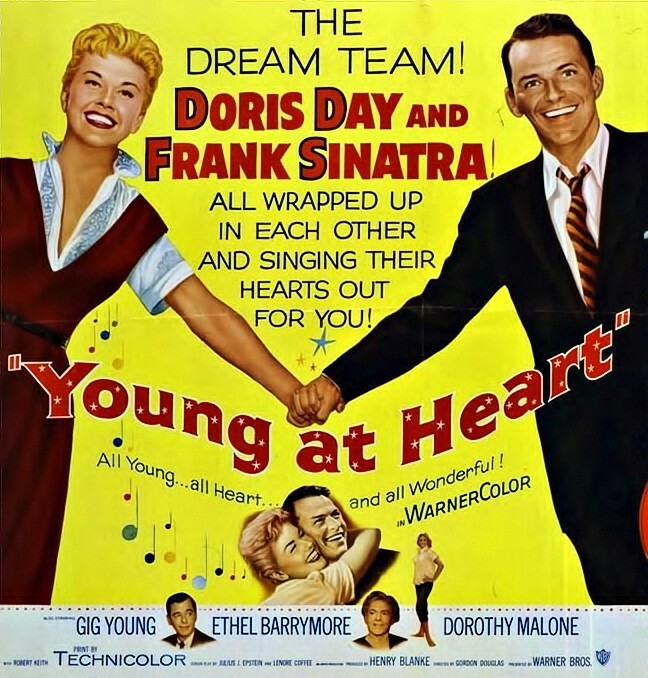 British Director and huge Doris Day fan, Terence Davies, introduces a screening of Young At Heart at the BFI (British Film Institute) with a loving tribute to the 1954 Doris Day/Frank Sinatra musical. Recalling the experience of seeing Doris in the film for the first time, Davies also lovingly pinpoints some of the technical and performance decisions featured in the film to emphasize the deceptively masterful craftsmanship of a work too often dismissed as mere sentimentality.